Giddy up cowboy lets wrangle some data. Whilst I continue on developing the story I have also been data wrangling and trying to get everything in order. As I started trying to edit a few weeks back I realised that despite the fact that everything was kinda working when I get further down the track and I have to show this to someone who actually needs to find things in some kind of ordered way everything is just going to fall apart. It's a RAID. If these go bust I'm a gonner. So the last few weeks of this year whilst also trying to get the story developed and have a better idea of exactly how I want to edit this film. Along with what is left to film. I will also be moving massive files between drives and sorting out file structures and naming conventions always with a blind panic in my heart that when I delete something I may have deleted the most important file of all accidentally. I am doing backups on backups and even maintaining a haphazard drive of sorts that remains in my first save, its saved file structure. Inshallah there are no files destroyed that I should have. Thankfully I have also come across a few articles on the web about how similar things have happened to others which makes me a little less nervous until I read how they also lost files. Added to this has been a bit of swapping around between FCP 7 and FCP X, two non-linear editing systems or one that was reborn. I was using FCP X when I was working at ANU and was reasonably happy with it despite everyones rage and concerns. Then I went back to FCP 7 as I thought I would find an editor to work with and that editor would only have or work with FCP 7. I have since not found an editor and have decided to jump back where I was feeling comfortable. The jump has been a success of sorts in that I find that it is so much easier to sort footage in FCP X than it ever was in FCP 7 and lord only knows that I have a bit of footage. Star Wars and the tentmakers. Bizarrely enough I am mixing my thoughts between Start Wars and the tentmakers today as I try and structure the tentmakers story. Star Wars is a pretty basic, however, exceptionally well told story. Using all the arc type characters and a three act plot. I am trying to build the same kind of storyline from the footage that I have shot of the guys in the street. I am looking for the Skywalker, Lailla, Obi Wan and Han Solo along with Darth and the empire. I have surprised myself at the characters I have found, I might even cast myself as a bit of a Chewbaka in the whole thing. The three act structure seems to work well in its initial Act 1 with its ordinary world and the call to action. It is just as I get further down the track and start looking for the ordeal, the transformation and resolution that I start to wander. I think tonight I may have to sit down to another viewing of Star Wars just to see whom I am able to cast in each role. Tarek's opening the new shop has thrown a pidgin amongst the cats in regard to my story. I had not initially had such a major role for this storyline. Now I am left questioning just how much I need to include as well as how much time I will need in the street filming before the end of the year. I am still fighting with software but I resigned myself to the fact that this was always going to be an issue so it doesn't bother me too much. I am moving back a forwards between the whiteboard and the laptop as I sort through footage and try more and more to break down my footage. Momentum is beginning as I build on my routine. My main goal is to be in the best position possible to start editing at the beginning of the year. There are three weeks before we take off for Czech for Christmas and as much as I would love to say that I could do some work there. I am certain it will never happen. And probably shouldn't being a family holiday and all. My goal is to have all of my footage sorted and as much as I can translated and in a state where I can start editing it in a time line also full of english speaking footage. This is my biggest and most confronting stumbling block at the moment. How to get through such a massive amount of Arabic footage. I like to think that I have a handle on what is going on but in reality I am reading nothing more than body language and the knowledge of the situation I am in. Anything more specific than that and I may as well be deaf. However I am in a better situation now, I think than I was before, as I am now in a studio with other Egyptian filmmakers who have offered to help me in regards to understanding what is being said on a more specific level. This will help in getting the right footage translated rather than just all of it. Still a long way to go and there has been a lot of time waiting at the start line preparing. I am excited to get really started with some measurable success. White boards, who's, wheres, whys, whats and an annoying fly. Today started with a reboot of the footage as I had tried to be to smart for my own good. Whilst copying files from one place to another and in the process lost the links to them all. No major problem just time I could have spent doing other things. Never the less I have used the time to fill up a white board with my needs and wants, story lines and the 5 Ws, one of which is a H. It has been quite rewarding and I think may have broken through some stumbling blocks I had in the story. The white board is my friend. 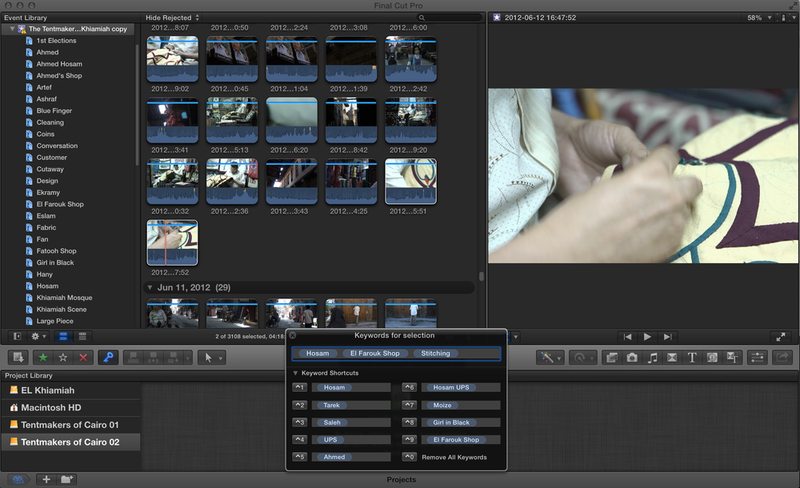 I still need to get a move on in regards to footage and definitely need to make a move on more translation. My biggest issue here is cost and so I have launched a short fundraiser on Facebook which may or may not be successful but if it is should be able to pay for several hours worth of translation. In regards to annoyances there is a fly that has been hassling me for hours. In my ears, on my neck, flew straight in my eye and one stage and even now has managed to land on the screen exactly where I am typing. Alas I am not at home and the chemical weapons I save for times like this have been boxed and cupboarded. Which is nothing like taking them out to sea but they are at least out of reach. Fly you are lucky. So far a good day and lets hope for more as I also need to put together a presentation for the Cairo Women's Association next week. Most of it is here just needs to be put in some kind of order. And the wheels fell off. Woke up this morning to a sick son who would not get out of bed, or would but would just fall asleep again wherever he was. Which for a teenager might be normal but a 2 year old, not. So a day at home and momentum on the work front is brought to a halt. My thoughts instantly go to how can I use this day productively? I can write, and will do. I can read and a book mentioned by Pam Holland on Facebook grabbed my attention so I downloaded it, 'Die empty, unleash your best work every Day' by Todd Henry. I also just received 'Tell me something' a KickStarter project I supported and I now have a great looking read with advice from around fifty documentary filmmakers. I could watch a documentary and try and deconstruct how it was put together, just so happens I have recently downloaded Ken Burn's 'Prohibition' documentaries, they alone would take up a whole day. Maybe I'll start with just one. I have already updated a few links on the website. Always looking for more articles, blogs, posts and pictures out there on the information super highway to add to the site. There is plenty I can do and Inshallah it will only add to what I still have to achieve in the studio on my return. Well two days in is no real indication of a routine however I feel that there have been some achievements. Now looking at a new editing package, or re-starting with a new editing package? Whatever. Starting to sort out footage and get it in some kind of order where I will then be able to start working on it. I also need to get a lot of translation done so sorting it out and working out what is the most important is probably the most important part right now. Have put aside the script for now as there have been new developments in the street. With Tarek opening his own shop and the impact that will have on the street but also on the Fatooh store as it has hit hard his leaving. Again sorting out and ordering the many, many hours of footage I have shot is only going to help in the scripting and in working out what is left to shoot. Feeling a bit calmer today, especially after having just found the Greek Club by the Nile for a quiet calamari and chips. Can see this place becoming a bit of a regular. Routine, routine, routine. I have to establish a routine if I am going to get this done. I sat here in an almost panic this morning as I started to get ready for what I am hoping will be a very productive couple of weeks. The past several weeks and months have been disturbed by visits and trips, none of which I disliked or regret having happened. I mean who could be unhappy with family travel and time away from the kids in Paris? The only issue is a break in what was already a very loose routine. I now have two weeks until again we will travel and again any routine is broken. I have now set goals, a way of motivating me to achieve small steps towards the bigger outcome. I also have a date to work towards where there needs to be something on the table, watchable, understandable and working. A deadline is the best thing I can have and the scariest thought.